KCMB Kansas City News: Anthony Weiner Democrat loses his composure in Congress. 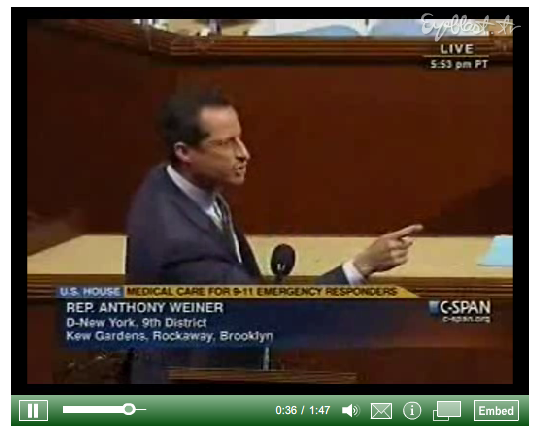 Anthony Weiner Democrat loses his composure in Congress. Who has the biggest Weiner? New York! Anthony Weiner, DEMOCRAT Congressman from New York, showed once again that he is the last one to get the message that his party is in trouble and the Democrats can no longer Jedi Mind Trick the general public into believing warped and twisted arguments that use puppies, babies, old ladies, and veterans as tools to touch heart strings rather than focus on the facts in the issues. Anthony Weiner, the biggest weiner in Congress, is seen in this video ranting...representing his Democrat party...as people like me who pay attention feel their jaws hit their shoes. This deceptive Democrat transfers the failing to fund a bill that would give support to the fallen heros of 9/11 from his Democrat party to the Republicans. The secret (shhhhh)...Democrats can pass his bill without 1 single vote from a Republican. So as you watch him rant, keep in mind that they don't need ONE VOTE from a Republican to pass this bill. November can't come soon enough. The Democrats know their days are numbered. When 3 branches of government controlled by people hell-bent on ruining our country are in power, the rest of us need to wake up, tell our neighbors to wake up, read the bills that are being passed before they are passed, have a voice, and understand that our country is the best country on earth and we need to play a major role in making it stay that way. Awesome Anthony! i appreciate your passion.